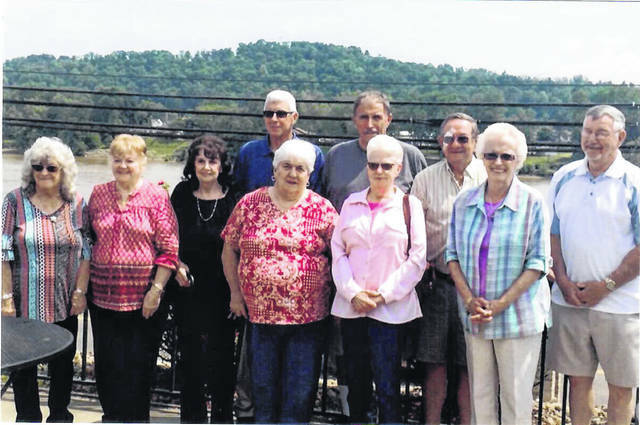 Eastern High School’s Class of 1958 recently held their 60th class reunion at Fox’s Pizza on the River. This senior class was the first one to attend school in the new Eastern High School, and their commencement was held there on Wednesday, May 21, 1958. The commencement speaker was the then Honorable William Saxbe, Attorney General of State of Ohio. The class graduated with 41 classmates and has lost 17 of those dear ones over the past 60 years. Attending were: Retha Sloter Murray and Karen Murray, Thornville, Ohio; Sue Sprague Springston, Hartville, Ohio; Jerry and Sheryl Cleland, Blanco, Texas; Ronnie and Marty Murphy Williams, Coolville, Ohio. Also attending were Steve and Barbara Hoffman, George and Brenda Glaze, Marjorie Schultz Connolly and Debby White, Mary Alice Sinclair Bowles, Roger and Paula Gaul, Sandy Savoy, Bob and Frances Kuhn, Ronnie and Gayann Gaul Clay, who all reside in Meigs County. Submitted by Gayann Gaul Clay.